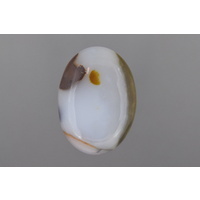 Polka dot agate is an orbicular agate produced from the Priday Agate Beds of central Oregon. It has an appearance that sounds just like its name. 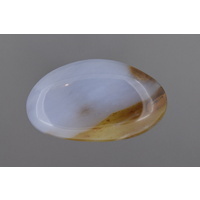 It is a semitransparent to semitranslucent agate with suspended round "dots" of contrasting colors. 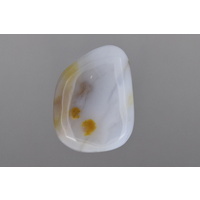 Polka dot agate's base colors range from blue to white to pale yellow. The dots can be almost any combination of yellow, orange, red, brown, or black. Some specimens also include black dendrites or cross-cut by inclusions of brown jasper.